I recently had the opportunity to attend a baking class at one of our local cooking schools. The focus was on cheesecake so I thought it would be fun to share one of my favorite holiday cheesecake recipes. These Peppermint Bark Mini Cheesecakes combine a traditional cheesecake with some classic holiday favors for an easy yet elegant party dessert! For these cheesecakes I substituted chocolate graham crackers for the traditional to give them a special holiday twist. Sometimes people ask me why I don’t mix things like the peppermint bark directly into the cheesecake. There are really two reasons. First, sometimes when you mix too much into the batter you get funny colors. It doesn’t impact the taste but unless I’m flavoring the cheesecake with a something like lemon or pumpkin spice I prefer to leave the flavorings as a topping. The second reason is then everyone can decide how much topping they want. If you want to add a fun twist to a holiday dessert buffet serve the toppings on the side and let your guest have some fun! Cheesecake is actually fairly simple to make if you keep a few important tips in mind. Be sure to let all of your ingredients come up to room temperature. If you don’t you may end up with lumps in your cheesecake! Don’t overbeat the mixture after you add the eggs. You want them to be just incorporated. Pat the mixture down into the bottom of the muffin cups and bake the crust first. This ensures your crust actually holds together after you add the cheesecake mixture. Let it cool before you put it in the refrigerator. 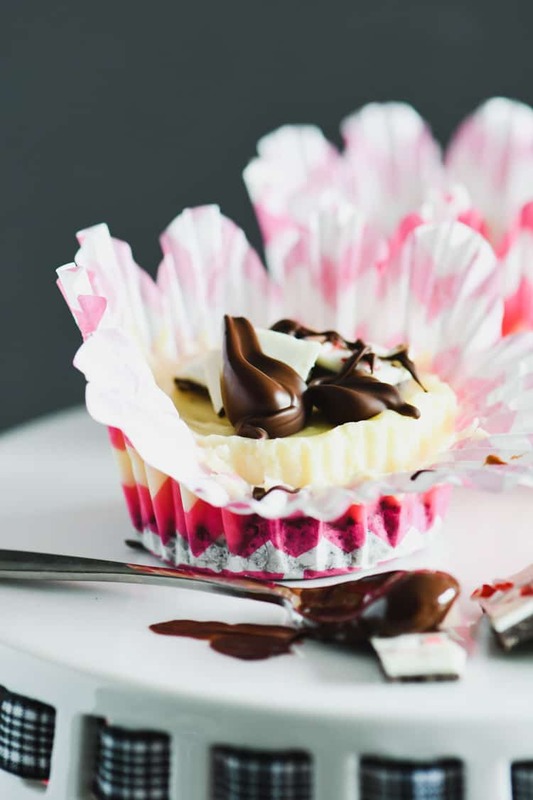 For these mini cheesecakes, 30-40 minutes is enough. If you are making a full-sized cheesecake, let it cool for 45-60 minutes before refrigerating. You can buy the peppermint bark premade at a local grocery store or candy store. If you want to take a little bit of extra time and make your own either this recipe from the Food Network or this one from Sally’s Baking Addiction would make a great topping option for these cheesecakes! If you can’t find it in a local store you can always order it online. 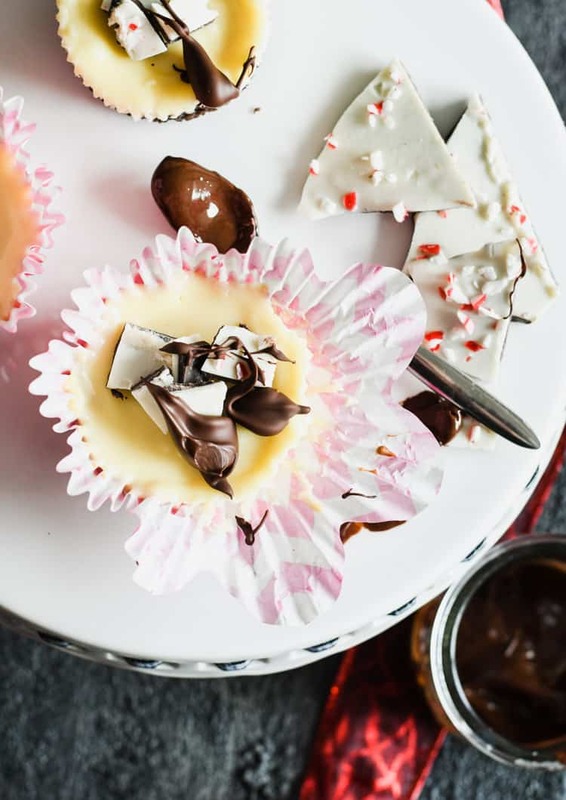 These cute peppermint bark cheesecakes will always be a crowd-pleaser! If you are looking for more holiday dessert recipes check out this Candy Cane Chocolate Fudge or this Christmas Trifle. There is even a Peppermint Bark recipe on All She Cooks. 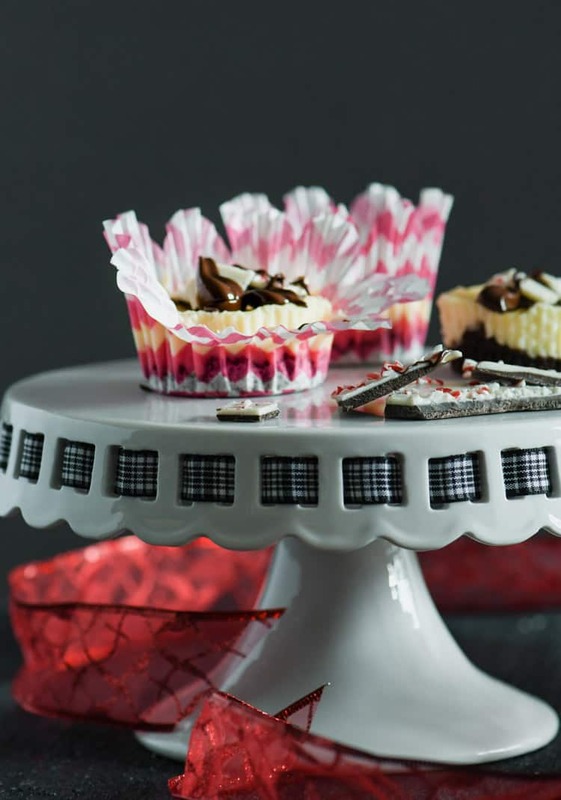 These Peppermint Bark Mini Cheesecakes are the perfect dessert for any holiday gathering. Remove the cream cheese and eggs from the refrigerator and let come to room temperature. Add the graham crackers to a food processor fitted with a standard blade and pulse until crumbled. Stir in the butter and mix until combined. Divide the mixture between the 12 muffin cups and press into the bottom of each cup. Bake for 8 minutes. Remove from oven. While the crusts are baking, add the cream cheese and sugar to the bowl of a stand mixer and beat until combined and smooth. Add the eggs, one at a time, mixing on low speed until just blended. Don't beat the mixture once the eggs have been added. Divide the cheesecake mixture among the 12 muffin cups, filling nearly to the top. Try to divide as evenly as possible to ensure consistent baking. Bake for 25 minutes. Remove from oven and let cool for at least 30 minutes. Refrigerate for at least 1 hour before serving. When ready to serve, remove cheesecakes from the refrigerator. If you like you can remove from cupcake liners or just leave them in the liners. Melt the chocolate chips in the microwave for 30 seconds at a time until smooth. 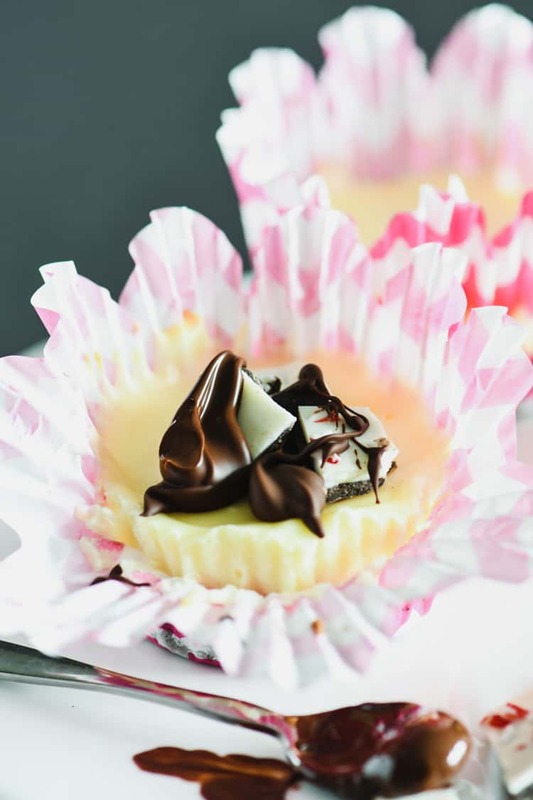 Top cheesecakes with peppermint bark and drizzle with chocolate. If you don't have a stand mixer you can use a regular hand mixer. I generally try to make cheesecake early in the day or even the day before I want to serve it. Cook and prep time does not include cooling time, so be sure to leave at least 90 minutes additional to allow the cheesecakes to cool.